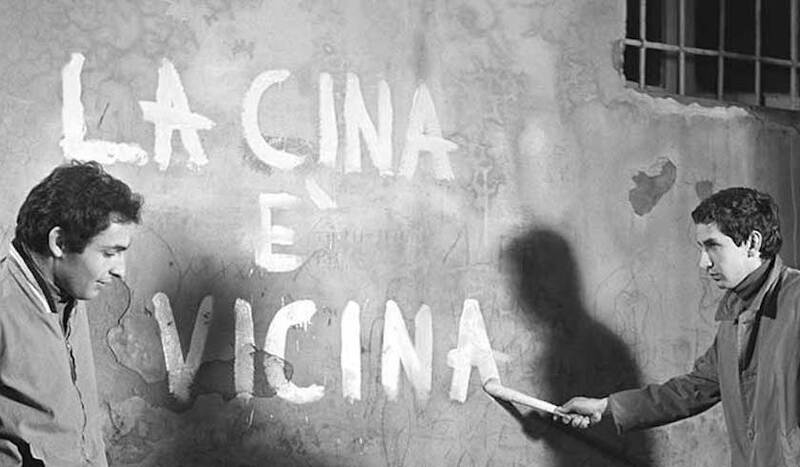 Detail of a still from Marco Bellocchio's La Cina è vicina (1967). This essay, written in 2015, forms the introduction to the forthcoming Chinese edition of Fanaticism: On the Uses of an Idea. Fanaticism is out now in paperback. China has long played the role, in the European and North American imaginary, of what an incisive Italian communist literary critic, Franco Fortini (himself a great admirer of Lu Xun and the author of a splendid travelogue of 1950s China, Asia Major) termed an "allegorical country" — a land and a history grasped as bearers of a distinctive configuration of human possibilities, but also a vast and distant screen on which to project the political impasses of the "Western" present. The debate on fanaticism whose vicissitudes I trace in these pages turned to China at crucial junctures. A century later this surreal scenario would find itself largely realised as Chinese revolutionary politics came to install itself as a major reference in Europe and beyond. Strangely, just as the "fanaticism" of the Taiping was both repellent and promising, regressive and necessary in Marx's eyes — thereby reflecting the tragic contradictions inherent in imperialist capitalism's destructively modernising effects, and in the nature of the resistances it elicited — so the Chinese revolution, and especially "Maoism" (as an ideological phenomenon largely internal to the European and North American Left, notwithstanding its reference to China) also became an object of magnetic attraction and intense reprobation at once. Now, if Soviet communism served as the principle culprit of what in this book I've called "philosophy's long cold war" from the interwar period to the late 1950s, especially in the guise of debates about "political religion," so Chinese communism became critical to the revival, especially in the later 1970s of an "anti-fanatical discourse," which saw its promotion of what Robert Jay Lifton called "revolutionary immortality" as the latest capturing of politics by the spirit of religion. In France, this was a discourse largely produced by figures who had, however briefly, associated themselves to the "Maoism" which had become a minoritarian if very influential force in the wake of the student and worker uprising of 1968, drawing into its sphere of activist influence the likes of Sartre and Foucault, and forming a generation of intellectuals (principally philosophers it should be noted) among whom Alain Badiou, Jacques Rancière, Emmanuel Terray, Benny Lévy (a.k.a. Pierre Victor), André Glucksmann, Christian Jambet, and others. While some of them thereafter maintained a commitment to radical, anti-systemic politics, many others undertook a path which repeated (at times in a more farcical than tragic vein) the trajectory of the European and US ex-communists of the 1940s and 1950s (for instance the authors of The God That Failed), who excoriated political fanaticism on the basis of their first-hand experience, turning their own politicisation and depoliticisation into a kind of subjective foundation and guarantee for the liberal politics of lesser evil, "human rights," and accommodation with capitalism that came to dominate the "long 1980s." For those who, in one way or another, remained faithful to the Maoist slogan that "it is right to revolt," "fanaticism," understood as the exceptional mobilisation of a subjective refusal to compromise, could not be expelled from politics without draining the latter of its content and force. In that respect, the insistent emphasis in contemporary French radical thought on "the subject" and "subjectivation" still bears the traces of the aftermath of May '68, when the (often ill-understood) Cultural Revolution in China appeared to herald a vision of mass communism steeped in spontaneity and intransigence, an antidote to the authoritarian ossification of Soviet Marxism and the cautious reformism of the official European labour movement. The purity of an uncompromising mass will — that was the figure of "fanaticism" that circulated among the militant minorities that acted with the confidence that, as a widespread Italian wall graffito went, "China is close" (La Cina è vicina). For partisans and detractors, "China" became (and continues to be) itself a kind of allegorical screen for thinking political fanaticism, including — in what to many would appear a paradoxical turn — looking to China's revolutionary decades for a dialectic of antagonism that could move away from frontal confrontation and destruction, as in Alain Badiou's attempt to appropriate the notion of "contradictions among the people" in a self-critical reflection on the twentieth century. Yet linguistic distance and a doctrinal or allegorical vision of the fate of revolutionary political subjectivity in China have often neglected an attention to the ways in which the uncompromising mobilisation of the refusal to compromise — to borrow the late Joel Olson's admirably concise definition of political fanaticism — was a matter of internal debate and reflection in China itself. Here, non-Chinese readers have gained much from the writings of Elizabeth Perry — especially her recent study of the vicissitudes of revolutionary tradition in Anyuan — but also from Michael Dutton's exploration of the questions of enmity and intensity in the history of Chinese policing practices, or Rebecca Karl's incisive short biography of Mao, where she revisits the way in which the accusation of "petty-bourgeois fanaticism" — wielded by Mao in his 1942 article "Oppose Stereotyped Party Writings" against the "one-sidedness" of some of his comrades — was flung back against him by Peng Dehuai at the Lushan Conference in intra-Party polemics over the Great Leap Forward. More significant and more contemporary — in terms of China's contribution to a transnational debate on "fanaticism" — is perhaps the nexus between neoliberalism and depoliticisation, which has been the object of some very illuminating writings by Wang Hui, in particular his essay "Depoliticized Politics: From East to West." Wang's account has the virtue of locating the systematic government of the passions by the interests over the last four decades in a longue durée vision of the farewell to the French and Russian (as well as China's own) revolutionary legacies, which binds the Chinese response to the Sixties to those occurring over the same conjuncture, if with quite different rhythms and valences, across the globe. In Wang's estimation: "The Chinese rejection of the Sixties is thus not an isolated historical incident, but an organic component of a continuing and totalizing de-revolutionary process." Perhaps most useful for my own purposes, and developing the discourse that concludes this book — on the possibility, following Gramsci, of immanent critiques of "left" fanaticism — is Wang's suggestion that depoliticisation in the Chinese context was also the product of the constitutive limits of the available forms of revolutionary politicisation — in particular, of the way in which the momentous struggles for de-bureaucratisation of the sixties and seventies were absorbed by the sectarian violence of factionalisms incapable of truly developing new durable forms of emancipatory politics, so that the strength with which a refusal to compromise was mobilised gave way to a demobilisation which was understandably experienced by many as a relief, a return to the securities of everyday life, a necessary acceptance of compromise. This is the "tragic" dialectic of politicisation and depoliticisation which is perhaps one of China's great and largely unheard lessons — not the notion that revolutionary thought was doomed to disaster by its intransigence, but that any concerted anti-systemic politics needs to inoculate itself against the undoing of politics which can be contained in the very assertion of the primacy of politics. Sometimes, as Wang suggests, it is what appears most political which can be the vehicle for depoliticisation: "The tragedy of the Cultural Revolution was not a product of its politicisation — signified by debate, theoretical investigation, autonomous social organization, as well as the spontaneity and vitality of political and discursive space. The tragedy was a result of depoliticisation — polarized factional struggles that eliminated the possibility of autonomous social spheres, transforming political debate into a mere means of power struggle, and class into an essentialized identitarian concept." Without underestimating the singularities of Chinese politics and history, it is also evident that this reality of depoliticisation — of modes of governing social and economic life that take the imperatives of security and affluence as pretexts for draining polities of the creative antagonism indispensable for emancipation — is one that today criss-crosses the globe, albeit not without exceptions. We have in a sense "returned" to a scenario in which the dominant figure of the "fanatic" is not the revolutionary or communist — as it might have been for Burke and the ideologues of counter-revolution and restoration after 1789, or for liberal and conservative anti-communists from the Paris Commune to 1968 — but rather the religiously-motivated insurgent. Today's counter-terrorism and de-radicalisation programmes thus bear a more than passing resemblance to the discourses of those imperial administrators rooting out "fanatics" from Afghanistan to Sudan (indeed in many of the same places now policed by drones). Whatever one's critical or political stance towards them, depoliticisation and deradicalisation are inbuilt features of the politics of contemporary states, which no longer draw their legitimacy primarily from discourses of popular sovereignty but from their (increasingly tested) capacity to promise security and affluence — a promise whose compatibility with capitalism's enormous expansion of social and regional inequalities is very much in doubt today. There is a curious if opaque link perhaps between the disappearance of the secular "fanaticisms" linked to socialist aspirations — the intransigent projects of equality that shook up Europe, China and the rest of the world throughout the late 19th and 20th centuries — and the proliferation of fanaticisms of religion and identity that have a landscape of violent inequality as their chosen stage. Only the invention of forms of politicisation and intransigence which have inoculated themselves against a drift into statist violence and its complement of depoliticisation will shift this otherwise dispiriting prospect of a bloody struggle between the mendacious universalities of state, capital and religion, in which collective emancipatory action risks becoming a distant memory. 1. Karl Marx and Frederick Engels, "Review" [January-February 1850], in Karl Marx and Friedrich Engels, Collected Works, vol. 10 (London: Lawrence & Wishart, 1975), pp. 266-7.